17825 Ravensburger Bookshelf Jigsaw Puzzle Colin Thompson 18000pieces. Our puzzles are a perfect way to relax after a long day or for family fun on a rainy day. The superiority of a Ravensburger puzzle is renowned. 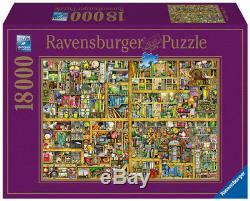 Be one of the millions to experience a whole new world of puzzling fun with Ravensburger quality products. Every one of our pieces is unique and fully interlocking. The quality is enhanced by the vast array of shapes made by our handcrafted tools - one of the many ways that Ravensburger shows its passion for excellence. SAME DAY DESPATCH ORDER BEFORE 1PM. GREAT BRANDS AT GREAT PRICES. AUTHORISED DEALER FOR ALL MAIN TOY & HOBBY BRANDS. In Stock ready for Fast Dispatch. Name: Colin Thompson Bookshelf 18000pc. Description: Our puzzles are a perfect way to relax after a long day or for family fun on a rainy day. Box Size: 490 x 360 x 180 mm. Puzzle is cut using only the highest quality premium grade card with a linen-paper finish for a glare-free image. Puzzle measures approximately 276 x 192cm when completed. Lovely gift for Colin Thompson fans! 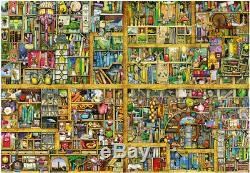 Puzzle image shows a crowded bookshelf full of strange objects. Product Group: Adult Jigsaw Puzzles. Product Type: LARGER PIECE COUNTS. Not suitable for children under 36 months due to small parts which pose a choking hazard. This product has no reviews yet, however see what our buyers say about our other products.. To maintain our service we only select the market leading couriers to deliver our orders. Same Day Dispatch, Monday - Friday. A select few items may have a longer lead time as they may be specially ordered from our manufacturers. For any customers outside the UK mainland, Northern Ireland or Isle of Man, we can arrange, on your behalf, for your items to be delivered via a third party company within the UK who will then deliver directly to you. We want to give you a hassle-free way to return anything, either as a UK or an International customer. We want you to be totally satisfied with your order, so if for any reason its not suitable we are here to help. How do I return an item(s)? RADICOOL TOYS Whybee Ltd Gaghills Mill GaghillsRd Waterfoot Rossendale Lancashire BB4 9BB. If you do not qualify for a free return you can simply send the item back to us via your preferred method, however we do recommend you use a traceable service so that you can track your items. (Only 1 free return per order). During festive and sales periods this may be extended slightly. Radicool is the authorised and official distributor and official approved online outlet for major toy brands including HPI RACING, TAMIYA , LEGO, HASBRO, JUMBO, BRIO, SCHLEICH, SCALEXTRIC, HORNBY, HAPE, ORCHARD TOYS, TOMY, BRITAINS, SYLVANIAN FAMILIES and many more. We specialise in supplying quality brands at competitive prices. The item "17825 Ravensburger Bookshelf Jigsaw Puzzle Colin Thompson 18000pieces" is in sale since Wednesday, December 5, 2018. This item is in the category "Toys & Hobbies\Puzzles\Vintage Puzzles\Jigsaw". The seller is "radicooluk" and is located in Rossendale.